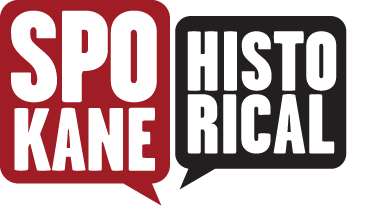 In 1908, Spokane launched its first National Apple Show with high hopes of making the area a major fruit distribution center. The inland Northwest was emerging from a decade of rapid apple-tree planting, with schemes of irrigation claiming nearly every lake and stream in Spokane County. Chief of these developed areas was the Spokane Valley, stretching for some thirty miles carved up by a dozen companies vying to produce the best apples. The idea to irrigate the Spokane Valley arose around 1896 from the inquiries of W. L. Benham, an already experienced businessman who immediately saw the potential fertility of the land, and the profit. 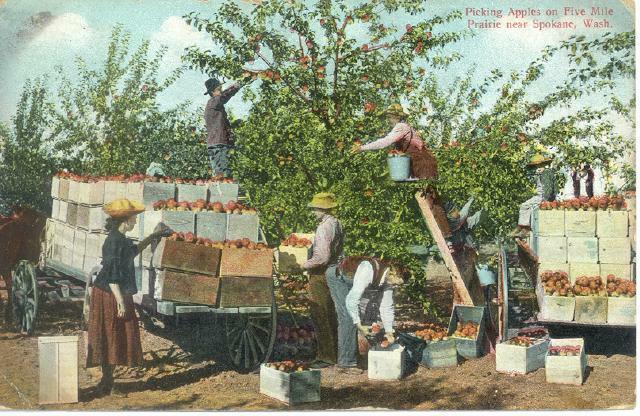 A combination of a mild climate, rich soil, available irrigation and railroads made Spokane Valley Washington's first commercial apple growing region. Advertisement ran abound, one could escape the noisy city to such plots of land titled, "Eden of America." Competing development was everywhere in Spokane Valley, Mark F. Mendenhall, a Spokane attorney and investor formed the Spokane Canal Company and in 1903 completed a drainage ditch from Newman Lake, which served as a canal to 2,750 acres east of the city known as Otis Orchards. 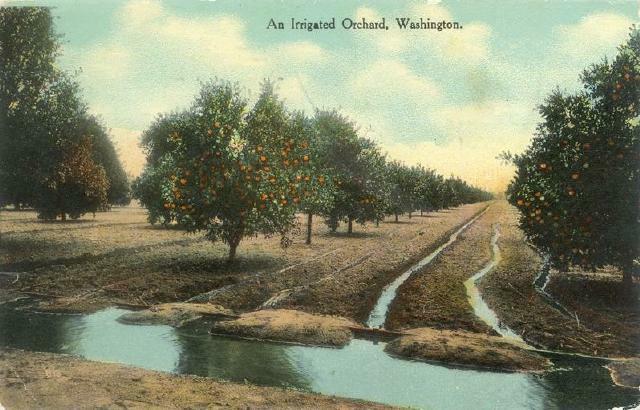 The Orchards published a booklet, "Irrigation is King" which circulated and soon enough had railroad workers and doctors alike turning their hand to horticulture. The air was full of "apple talk," one recalled. Otis Orchards would soon have an income of $4,375,000 a year. However, Spokane orchardists were relatively inexperienced at their newfound trade, by 1912, apple production exceeded demand. From 1913 to 1916 there were two million new apple trees each year, a veteran of trade chastised growers claiming they destroyed their business by, "reckless promotion." Independent shippers slashed prices and marginal growers failed. Soon Spokane couldn't match Wenatchee's and Yakima's appeals to luxury markets where high prices would pay the costs of growing and shipping. Tragedies accumulated across the Valley, Otis Orchards was plagued by collapsing canals and an uncertain water supply, property holders found reconstruction and maintenance to be more than they could afford. Slowly apple orchards dwindled, as farmers turned to crops more readily saleable in local markets. However, Otis Orchards would endure longer than any of the other apple districts, as one the last remnants of the colossal apple boom that occurred in Spokane Valley in the early twentieth century. 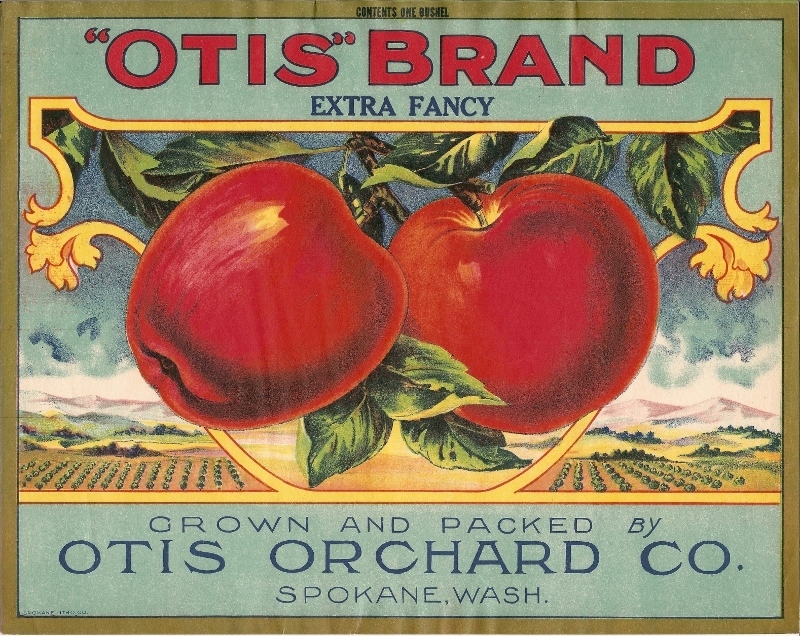 Otis Orchard Advertisement: The success of Spokane's "extra fancy" apple production was widely advertised across the state of Washington with companies like Otis Orchards. Photo courtesy of Spokane Valley Heritage Museum. 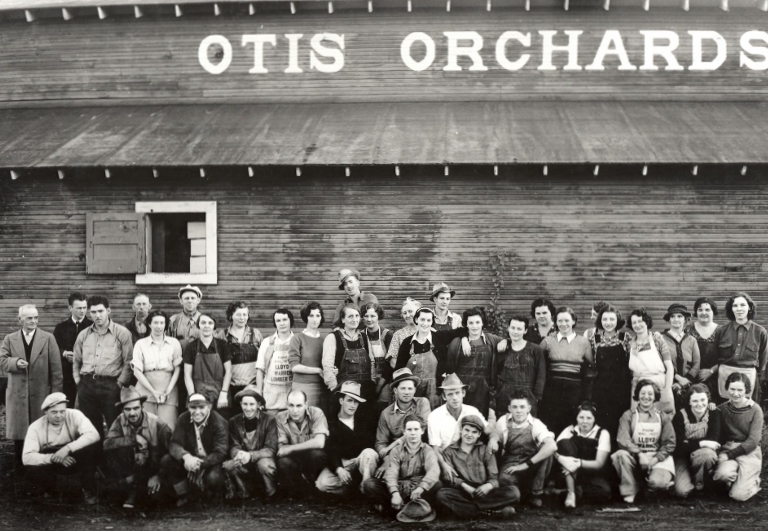 Apple workers at Otis Orchards: All manner of local Spokane folk flocked to be part of the apple boom, as seen here with Otis Orchards employees striking a pose. Photo courtesy of Spokane Valley Heritage Museum. Thomas Kassa, “The Apple Boom and Otis Orchards,” Spokane Historical, accessed April 21, 2019, https://spokanehistorical.org/items/show/529.